While many tales of fall accidents involve a slip on ice and snow, the truth is that all seasons pose a risk of slipping or tripping accidents. In fact, summer slips are arguably more deadly, since a slip and fall into a hot tub or public pool can cause a victim to lose consciousness and drown in a matter of minutes. According to the Centers for Disease Control and Prevention (CDC), roughly half of all drowning victims treated in emergency rooms require hospital admittance for further treatment. Even drowning incidents that are not fatal injuries can result in severe brain damage due to lack of oxygen to the brain, causing effects ranging from memory loss or learning disabilities to permanent vegetative states. A person who slips on a wet pool surface—such as a diving board or the concrete floor surrounding the pool— should have his or her case examined carefully by an attorney. In many cases, these accidents were entirely preventable, and the injury could have been avoided if the pool’s owner or operator had not been negligent. Failure to prevent standing water, ignoring reports of leaking faucets and backed-up drains, and use of chemicals that are known to increase slipping can all make an owner liable for the costs of injury. 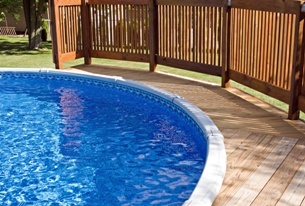 Slips and falls are just one of the ways a victim can suffer drowning or severe bodily injury in swimming pools. Most fatal drownings in children under four years old occur in home swimming pools, while children over four are more at risk in public pools, water parks, resorts, and open water. Drain entrapment. Drain covers and suction outlets have caused a variety of injuries to swimmers in the past, especially to children. Victims may get their arms, legs, hair, or swimsuits caught in an improperly covered drain, causing entrapment that leads to drowning. Swimmers who escape from faulty drains may suffer amputation of fingers and toes or disembowelment in the process. Faulty gates or fences. Drownings often occur when a child enters a pool area without supervision. Owners have a duty to install proper fencing around the entire pool area, and all gates should have secure latches to discourage unauthorized access. Fences that are too short or have too much space between pickets may not be effective in keeping children out, making the owner liable for injuries. Overcrowding. Too many swimmers in one pool can make it difficult for lifeguards to identify drowning victims and can hinder rescue attempts. All pools should have a strict limit on how many bathers can occupy the pool at one time, and owners and staff should enforce these rules. Water clarity. Cloudy or murky pools are typically a result of poor maintenance and improper chemical treatment. Children can easily be lost under water. Since swimmers can be hard to see if the water is not clear, pools should be regularly tested and shut down immediately if the drains in the deepest part of the pool are not visible. Poorly lit pools. Pools must be adequately lit, both in the water and in the surrounding swimming areas. Lack of pool lighting can cause dive injuries, hinder rescue attempts, and make it impossible for lifeguards to see a drowning victim until it is too late. Inadequate depth markers. Peeling or faded depth markers on the sides and bottom of the pool allow swimmers to float into a deeper end of the pool without realizing it. Depth markers and demarcation lines should be repainted regularly and the shallow end of the pool should be sectioned off with a float rope to warn swimmers of changes in depth. Inattentive or untrained lifeguards. Lifeguards on duty should give their full attention to swimmers, and be ready and trained for rescue at all times. The pool should also have emergency equipment (such as emergency phones, ring buoys, and life ropes) immediately accessible to the public and to staff. Design or building violations. Dangerously designed pools may have blind areas, rock faces, or waterfalls that create an unnecessarily perilous area for swimmers. In addition, pool areas must be constructed in compliance with all applicable building codes and operate under valid pool permits. Owners of pools and waterparks have a duty to protect swimmers from injuries on their properties. If you or someone you love has been injured in a swimming pool or hot tub, we can help. Our injury attorneys can document the scene and perform an investigation of the circumstances surrounding your accident, getting you the compensation you deserve for your suffering. Contact our legal team today to schedule your free, no-obligation consultation.